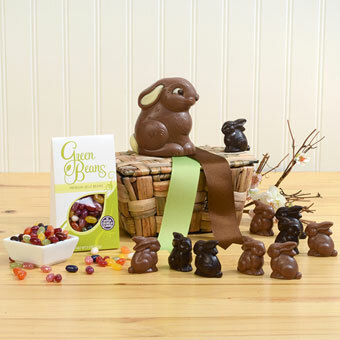 Two favorite Easter candies come together in one charming gift! Our reusable jute tote features a herd of baby chocolate rabbits - 5 milk and 5 dark - watched over by a mama bunny from EMVI Chocolates. And, because bunnies don't always eat carrots, we've included a generous bag of all natural jelly beans....our take on the perfect rabbit food!